Professional photographer Chase Jarvis lives by the maxim that the best camera is the one that you have with you. These days that’s likely to be your camera phone. How can you optimize the photos you take with it? Read on for some quick tips. 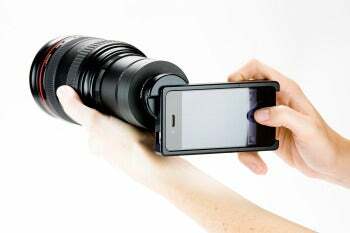 Zoom with your feet: Many camera phones include a digital zoom function, which you should avoid because it will quickly degrade the quality of your final image. Whenever possible, get closer to your subject by walking up to it (or wait for the subject to come to you). Look for the light: Good photography requires good light. You can’t always choose when to take photos, but avoiding midday glare is always a good idea due to the harsh shadows that appear at this time. Get steady shots: To avoid blur, shake the camera as little as possible. Camera phones aren’t always the best shape for ensuring a good, steady grip, but you can use a nearby wall or telephone pole as a makeshift brace. Alternatively, consider a cell phone tripod such as Joby’s Gorillamobile. Clear the background: If you want to capture great portraits, pay attention to what’s behind your subject. Try to find a simple, uncluttered background--nothing looks worse than tree branches or some other distraction appearing to grow out of your subject’s head! Crank up the resolution: Change your phone’s camera-quality settings to ensure that it captures images at the highest resolution possible. The higher the resolution, the higher the quality of your final photo. Check out our smartphone camera roundup to get an idea of which phones offer the best cameras. Be wary of shutter lag: Make sure to hold the phone steady until you see the final image on the screen. Significant shutter lag plagues most camera phones; this means that the camera is still engaged in the act of capturing the image after you have pressed the shutter button. The lag may last only a second or so, but that can be enough to blur the image. You don't need crazy accessories to take great photos with your phone. Experiment with angles: The compact dimensions of a phone may give you the opportunity to exploit interesting angles or vantage points that you can’t with a DSLR or digital point-and-shoot camera. Don’t be afraid to try a variety of angles or elevations to capture unique images. Keep it clean: Make sure that the camera lens on your phone is clean. People often keep their phones in pockets that they use for all manner of things, but if you ensure that the lens stays clear of grease, dust, and scratches, your photography will benefit. Fill the frame: Try to fill the screen with your subjects. It’s a simple way to give photos more impact and make them stand out on small displays. For example, head-and-shoulder portraits often appear more dramatic than full-length body shots. Shoot more and shoot often: Taking a lot of pictures is good for getting extra practice, and it increases your chances of capturing a fantastic photo. Unless your memory space is limited, snap away while you can, and delete the duds later.